Designed with the consumer in mind, The Suncast ELEMEMTS Collection comprises a versatile selection of furniture and accessories crafted for unique and intriguing outdoor spaces. Every outdoor space is a unique mix of a homewoner's character and style. The components of the Suncast EELEMENTS Collection have been designed to mix and match and to create distinctive and cohesive environments. The Suncast Club Chair is an essential piece that complements any outdoor space. Built-in storage under the seat provides a place for a cushion or patio accessories and the durable resin resists weather wear. Elements Outdoor Club Chair with Storage in White Designed with the consumer in mind, The Suncast ELEMEMTS Collection comprises a versatile selection of furniture and accessories crafted for unique and intriguing outdoor spaces. Every outdoor space is a unique mix of a homewoner's character and style. The components of the Suncast EELEMENTS Collection have been designed to mix and match and to create distinctive and cohesive environments. The Suncast Club Chair is an essential piece that complements any outdoor space. Built-in storage under the seat provides a place for a cushion or patio accessories and the durable resin resists weather wear. 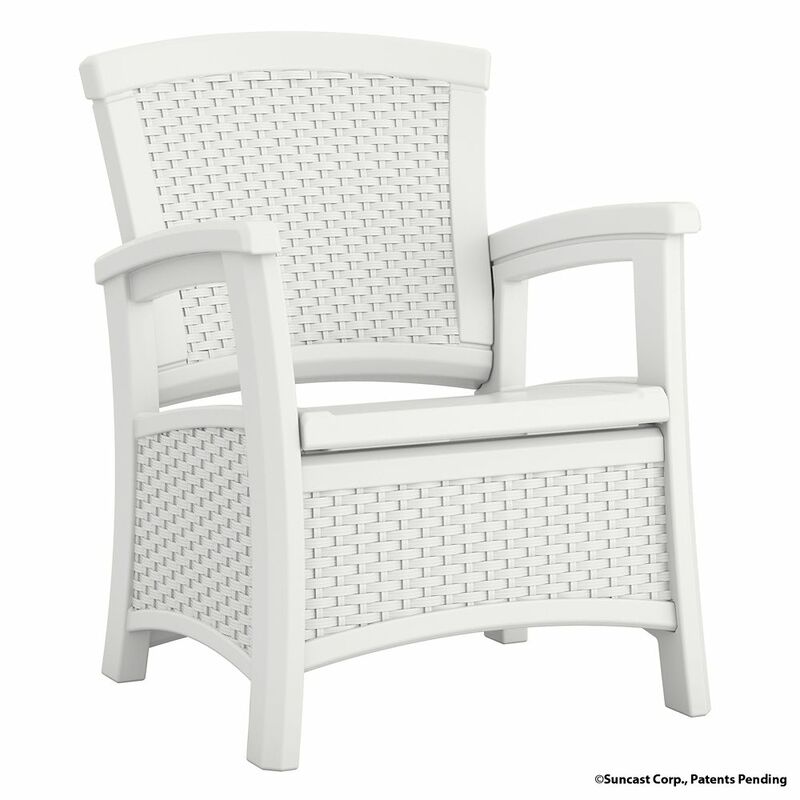 Elements Outdoor Club Chair with Storage in White is rated 4.5 out of 5 by 12. Rated 5 out of 5 by NJW from Love it. I'm a 64 yr old woman and assembled... Love it. I'm a 64 yr old woman and assembled it myself in no time. Of course it needs cushions. Looks great on my lani and having the storage is nice to have. Rated 5 out of 5 by Happyshopper from Very sturdy and comfortable. Love my chairs. Very sturdy and comfortable. Love my chairs. Rated 5 out of 5 by Trud from I purchased two of these chairs for the outside patio. They are so comfortable to set in. I wa... I purchased two of these chairs for the outside patio. They are so comfortable to set in. I was so pleased that the cushions I use can be stored in the seat to prevent the dew from getting on them. THEY really are nice chairs and they are very fashionable!!!! Rated 5 out of 5 by princess from LOVE LOVE LOVE this furniture!!!!! Excellent quality, he... LOVE LOVE LOVE this furniture!!!!! Excellent quality, he put it together quick for me, very comfortable to sit on and love the storage, highly recommend along with free shipping to my home.